Any acts that Prevents, Disrupts or Disturbs the Regular academic Activity. Any activity which is likely to cause Annoyance, Hardship, Physical or Psychological Harm or Creates Fear. Any acts of Financial Extortion or Forceful Expenditure. Any acts of Physical Abuse causing Assault, Harm or danger to health or life. Act of Wrongful Confinement, use of Criminal Force Trespass or Intimidation. Debarring from Appearing in any Seasonal test/ University Examination. Fine upto Rs, 25,000/- to the Concerned Student or Group of Students. Rustication from the Institution for the period of One to Four Semesters. 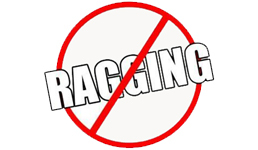 Entry in the Character/ Transfer Certificates regarding the Punishment given for any Act of “Ragging”. Complaint may also be reported to respective tutor Guardians, Hostel Wardens, Bus Incharge, HOD’s, Dean, Principal.